Leave a short plug for one of your own or someone else's mysteries on Monday, another on Tuesday, or the same one again on Tuesday! Don't forget to leave a buy link and your website/blogspot link as well. Only one per day, please! Mine is Killer Career - a romantic suspense about a lawyer whose career change could be deadly for her and those she loves. The daughter of James Lee Burke "is a terrific web spinner" who "knows when and how to drop clues to keep readers at her mercy," according to Entertainment Weekly. Her two series feature NYPD Detective Ellie Hatcher and Portland Deputy District Attorney Samantha Kincaid. A former prosecutor in the Portland, Oregon, DA's office, she currently teaches criminal law and procedure at Hofstra Law School in New York. 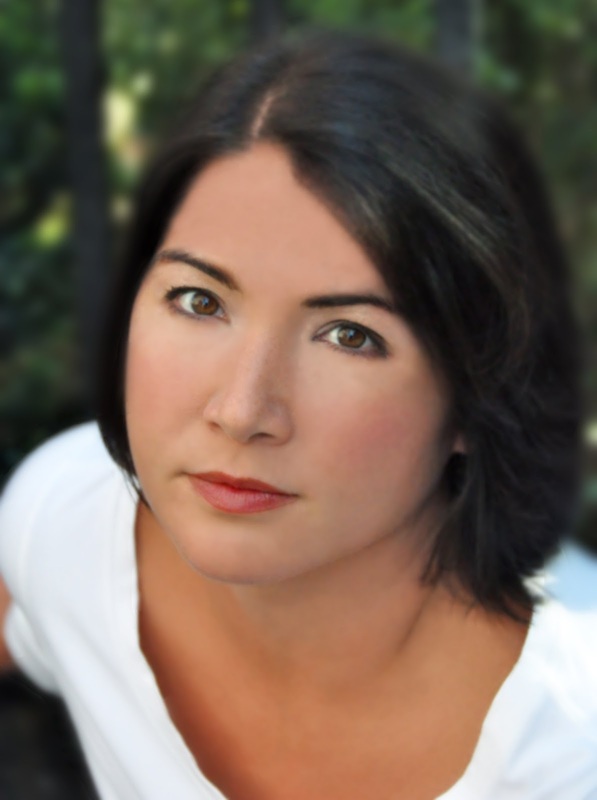 Alafair, how did NYPD Detective Ellie Hatcher come into being as well as Portland Prosecutor Samantha Kincaid? I was a prosecutor in Portland, Oregon, for several years. After leaving to move to New York, I missed my office. I missed Portland and my friends. And as a long-time mystery reader, I had always wanted to write a crime novel. I thought I’d finally learned enough about the world to give it a try, so I started with Samantha Kincaid, who is a prosecutor in the very office where I served. By the time I was working on my fourth novel, I’d been living in New York for a few years. I thought the anonymity that comes only in a city this big was exciting territory for me as a writer. I was also ready to write a faster paced book with an investigator, instead of a lawyer, at the center. I had a story I wanted to tell that involved Internet dating, and I thought a young New York City detective was the perfect narrator. I actually meant for that book (Dead Connection) to be a standalone, but I knew when I wrote the final chapter that I’d still be hearing more from Ellie. What prompted your Duffer Awards? The only thing I love more than reading books is talking about them. Sometimes I think I only write so I’ll have a work-related reason to talk all day about mystery novels. I’m traveling less this year for book tours, so I wanted to do some fun things online that would involve interaction with readers I might not get to see in person. A couple of months ago, I gave out some so-called “Duffer Awards” in my newsletter, and my readers thought it was a big hit. I thought it would be fun to let readers vote on a new award every day for a month. And since I don’t like real competitions like smartest sleuth, where feelings can be hurt, I decided that the awards had to be for silly stuff like Best Hat and Most Likely to be Institutionalized. I hope crime fiction readers will stop by every day to cast a vote on each category. And to sweeten the pot, anyone who posts a comment is entered to win signed books and gift certificates to booksellers. The more comments, the more chances for loot! The awards are at http://www.alafairburke.com/. How do you manage to write two crime series while serving as a Professor of Law at Hofstra University? What’s your writing schedule like? I honestly don’t know how anything gets done. I Facebook, Tweet, and eat constantly, yet at the end of the year, I usually have a book and a couple of law review articles on my computer. I do try to write every day, and very rarely miss two days in a row. That continuity makes a big difference. Even if I only write a couple of paragraphs on a busy day, I can jump in the next day, fully aware of where I am in the story, how my characters’ voices sound, and how they feel in that moment. 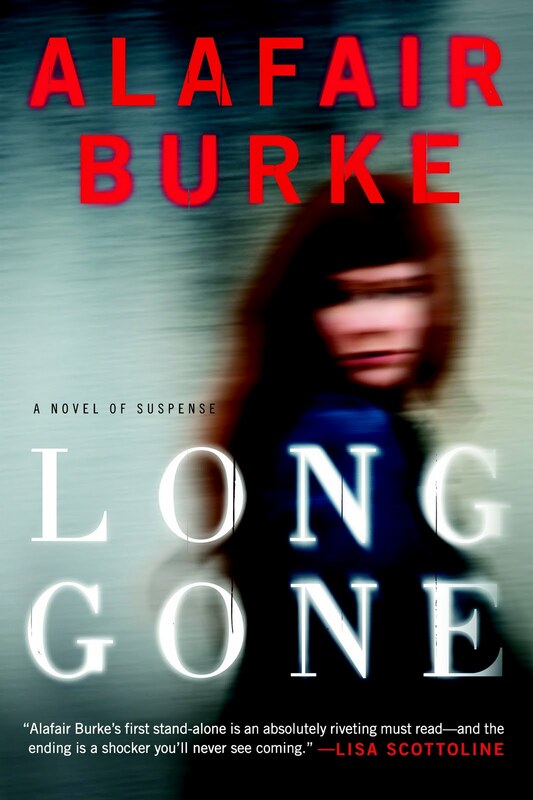 I’m very excited about Long Gone. It’s my first stand-alone thriller. I guess I said that about the first Ellie Hatcher book, too, but this time, I think I really mean it. And it’s the first time I’ve written about a character who is outside the criminal justice system. After a layoff and months of struggling, Alice Humphrey finally lands what she thinks is her dream job managing a new art gallery in Manhattan’s Meatpacking District. Everything seems perfect until the morning Alice arrives at work to find the gallery gone—the space stripped bare as if it had never existed— with the man who hired her dead on the floor. Overnight, Alice’s dream job has vanished, and she finds herself at the center of police attention with nothing to prove her innocence. There’s also a missing girl from New Jersey, a rogue FBI agent, and Alice’s nightmare family running around the pages, but I promise it’s all one story. This is a higher concept book than my series novels, and sometimes those don’t end as successfully as they start. I’m very proud of how all the threads come together here, though. How much did your father influence your own writing? With a father who was writing and mother who was a librarian, we were a family that not only told stories, but thought it was perfectly natural to write them down. My mother would take me to the library every Saturday for a new stack of books. The rhythms of story telling and character creation become ingrained when you read all the time. Advice to fledgling crime writers? Read. Read a lot. But don’t try to copy anyone. Figure out what you can offer the genre. And then write every single day – without starting over – until you finish. Once you have a beginning, middle, and end, it is much easier to make adjustments than you’d ever believe. The hard part is getting it done. How, in your opinion, is the ebook revolution affecting major publishing practices? What has brought you the most pleasure and satisfaction? Knowing that someone is reading your work is a grand high. When I hear from readers who say they stayed up all night because they couldn’t put down one of my books, I still want to scream out loud. I don’t believe in regrets. Maybe my very first book would have been better if I’d cut back on some detail, but debut novels are detailed for a reason. New writers share some of the same habits. I like to think that every book I’ve written has been better than the rest. As someone who cares more about the longevity of my publishing career than dollars and cents, that makes me pretty content. Bouchercon 2011 happened to coincide with my mother's 90th birthday. As both Bouchercon and Mom are in St. Louis, I was able to make both. I had not been to Bouchercon since 2005, so I had a lot of friends to catch up with, but that's what the bar and the hospitality room are for. I spent way too much time and money in the bar and talked myself hoarse on Friday night. One of the best things about Bouchercon is the book bag. This one was huge. I won't list all of the books I received, but two that really look exciting are The Ice Princess by Camilla Lackberg and The Deputy by Victor Gischler. Lackberg is one of Europe's top novelists. 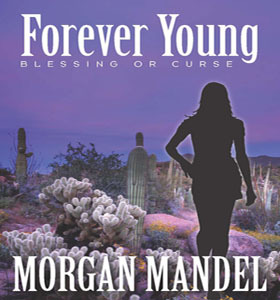 The buzz at Bouchercon is that she will soon be one of America's. Gischler is the author of hard-boiled crime fiction such as Gun Monkeys and Go-Go Girls of the Apocalypse, so I know this one will be a wild ride. The Private Eye Writers of America held the Shamus Award dinner on Friday night. Lori Armstrong's book, No Mercy, won best P.I. hardcover. Lori seemed shocked to win. A lot of people expected Robert Crais to get the award for The First Rule. I'm going to get Armstrong's book for sure. Mercy seemed to be the theme for the night. Michael Ayoob won Best First P.I. Novel for In Search of Mercy. Sarah Paretsky was given the Hammer Award, a new award for best character for, who else?, V.I. Warshawski. The award so move Sarah that she was speechless. The Shamus award dinner is always held off-site. This year it was held at a St. Louis landmark, Anheuser-Busch Brewery. All the beer we could drink. Thank God I didn't have to give a speech. Bob Randisi, who founded the PWA, was one of the special guests of the convention. He's written over 550 books, averaging 16 books a year. For most writers, 16 books would be a productive career. He did not reveal any secrets except that he likes to tell stories. None of the panels struck me as extraordinary this year, though with five concurrent sessions each hour, it was impossible to get to all of them. There might very well be some great ones that I missed. Don't get me wrong. Most of the panels I attended were informative and fun: Max Allen Collins telling about his relationship with Mickey Spillane; Collin Cotterill, Linwood Barclay, Bill Crider, Lisa Lutz and Elaine Viets talking about their one star Amazon reviews. In reality, the panels are secondary to the real fun of Bouchercon—a four day conversation about crime fiction with writers and readers from around the world that flowed in and out of the bars, the dealer room and through the halls. This past weekend I've been in Morro Bay and San Luis Obispo. As part of the staff of the CCWC, hubby and I stayed at the La Serena Hotel overlooking Morro Bay. The conference was held on the Cuesta College Campus. What was unique about this conference was the fact that what is happening today with publishing was the main theme. Huge example, Mark Coker, the founder of Smashwords was one of the keynote speakers at the beginning and the end. The first day was begun with a talk about all the tech toys and demos. 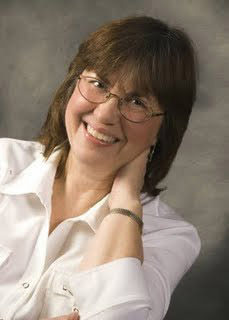 Laurie McLean, an agent with the Larsen Pomada Agency, is now working with authors to promotr e-books. Jonathan Maberry gave a rousing keynote about his path to publication, his writing habits, and lots more. He also taught a class on thriller writing. One class was on blogging. There were plenty of the usual classes, something for anyone no matter where they were in their writing career. I taught a class on Mystery Writing 101 and another on The Importance of Setting. Full classes and great students. This was the first time I've ever been to this conference and I was truly impressed: well organized, lots of topics to choose from, top-notch instructors, I felt honored to be one of them. Jonathan Mayberry spoke and taught a class on writing thrillers. Sunday morning my husband and I went to a pancake breakfast sponsored by the American Legion. He's a member of the Sons of the American Legion, and likes to attend their events, plus who could pass up their great breakfast spreads! We also enjoy being members of the Festival Committee, which runs a five day event with the Fourth of July as the main fulcrum. Those are a but a few organizations in our area, which help the community and also give their members a feeling of belonging. There are quite a few others. How can community organizations relate to writing, especially mysteries? Bestowing a community spirit on your characters can be a way of rounding them out, showing they have values, generosity, and are decent people, as well as giving them a focus or goal. Or, the opposite - A character can be devious and pretend to have the well being of the community at heart, but actually be plotting a vicious crime. Organizational doings can be a great backdrop for something unusual to take place, like a murder. Characters suffering from the results of crime can find a measure of relief by becoming part of a community and getting caught up in the spirit. Have you included something similar in one of your books, or do you know of an example? What do you think of the idea of including some form of community spirit in a mystery? DWD: Is it a crime? We drove our RV to San Diego the other day and took I-10 to Interstate 8, which dictionaries could use to illustrate the definition of desolate. We had the road mostly to ourselves as we motored along at a cruise-controlled 60 mph. A storm front had already come and gone earlier in the trip, leaving us with bright sunshine, dry air, and our thoughts to ourselves. Blistering-hot Yuma lay in the distance for our overnight stop. We played music on our iPod, but we've heard it all before; we chatted amiably, but as an old married couple we've said it all before. My mind drifted to writing projects. The lonely Interstate was a good place to plan the broad outlines of a novel. So I began Driving While Daydreaming, which shouldn't be a problem as long as the driving takes precedence. I started thinking of some of my co-workers over the years of my checkered career, and who had traits that would make good fictional characters. And then I thought of some of my bosses. It didn't take long to think of one or two who would make dandy victims in a murder mystery. Mind you, most of them were essentially nice people, but some had a trait here or there that had me grinding my teeth. Combine the worst traits of several bosses, and voila (or viola, for the musically inclined)--you have the Victim Who Deserves It. The entire office will shed crocodile tears, secretly glad someone else did the deed for them. A unique plot? Of course not. Precious few basic plots exist, but only you have had that particular combination of godawful bosses and quirky co-workers. That's where you make the story your own. You don't want to describe real people, of course, so be sure to mix everything up. Combine not only personality traits but people's looks, even gender and occupation. And then get out your virtual gun, twirl your virtual mustache, and plot a virtual crime. Don't worry. Keep your eyes on the road, and a jury will never convict you of DWD. I try to keep up with what's going on in the world for the sake of my characters when I'm writing. However, I'm too old fashioned to jump at all the latest gimmicks out there. I still just use a cell phone to make phone calls. 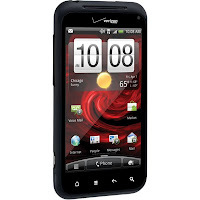 It receives text messages, but I delete them if someone dares send me one. It has the usual number buttons, though I'm not interested in sitting around trying to figure which numbers to press to spell out "get lost." I have considered getting a smart phone to learn what my characters might do with it, but I haven't taken the plunge yet. I did give up and go high-tech with the TV a week ago. I'd been content with a remote that changed channels and switched on and off. We've used a DVD/VCR to record the CBS evening news and my wife's favorite morning show, The Price Is Right. The recorder had been screwing up recently, though. After numerous efforts to watch the news or Drew Carey failed, we decided something had to be done. Our old 32-inch TV, a monster device that weighed a ton when I tried to move it, was at least twenty years old, though it still had a fairly decent picture. We decided to go all out and get a 42-inch flat screen model with High Definition. Comcast had provided us with a small gadget that sat on top of the TV when they went all-digital. I discovered a full-size cable box would be required to get HD on the new set. I also discovered for the same price I could get a cable box/DVR, a digital video recorder. I got all the connections made and the device activated and voila! Up pops a menu will all sorts of possibilities. The TV has a Wi-Fi connector. I can connect with my computer and display Internet content on the TV screen. Do streaming movies, photo albums, all sorts of things. With the Comcast box, I can record TV programs galore. Using ON DEMAND, dozens of programs telecast over the past week are available to watch again, plus dozens of movies. The only problem is I have two manuals (TV and cable) and three CDs to peruse to learn how to use all this stuff. Technology, ain't it great? Ugh! I suppose it's necessary to give me the ability to keep my characters in vogue with the times. How about you? 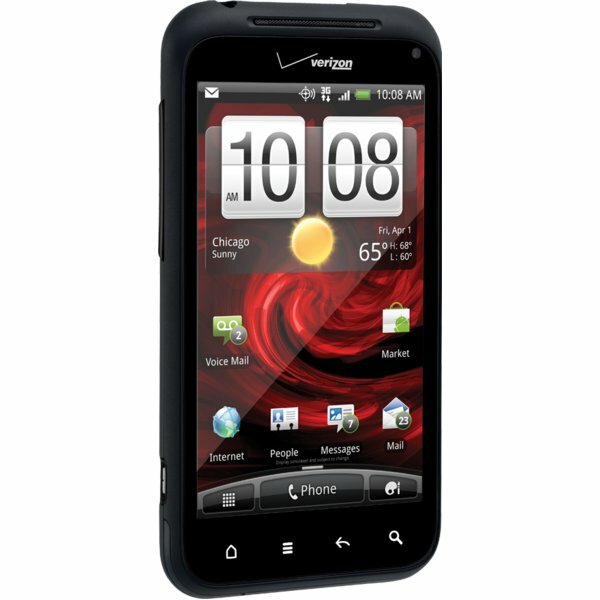 Have you upgraded your life to take in all the latest gadgetry? The new Sid Chance thriller, The Good, The Bad and The Murderous is now available. When Sid gets the call to prove a young man who spent most of his life in prison for a murder committed at age twelve is not guilty of a new homicide, things get dicey fast. Think Medicare fraud, drug trafficking, a bad cop, and a hired killer. Order at The Bookstore on my website. Dallas, Texas. A hotel conference room. An orientation meeting with an insurance company I had just joined. There were about forty of us in the room. We were watching a video presentation when one of the insurance company executives entered the room, flicked on the lights, and stopped the video. “A plane has just crashed into the World Trade Center,” he announced. Stunned silence. No one in the room spoke or moved for several seconds. A guy at the table in front of me turned around and smirked. Then I got it. Some idiot in a two-seater Piper Cub lost control, fell asleep or something, and ran his little propeller through a window of the skyscraper. I smirked back. “It’s on TV in the next room,” the guy at the front said. We all followed him next door to a similar room, except this one had a TV hanging on the wall. We needed a break. The video we’d been watching was a real schnoozer. I wasn’t expecting the scene I saw on the TV screen. My first thought was someone made a mistake. We were looking at a scene from a disaster movie, a science fiction thriller, or an alien invasion epic. It took a while for the reality to sink in. This was real. This really happened. In America. In New York City. We spent the rest of the morning watching the news. Some scenes were forever etched in my memory. A crowd of people in the street, being chased by an enormous dust cloud when the first tower fell. The second plane hitting the second tower. Police officers and firefighters covered with chalky dust trying to establish order in an incredible, unbelievable chaos. For the rest of that day and several days afterward, I was glued to the news as the rest of the tragedy played out. The pentagon damage. The plane going down in Pennsylvania. I’ll never forget the wall where people posted pictures of missing loved ones. President Franklin Delano Roosevelt said, “A day which will live in infamy.” He was talking about December 7, l941, of course, when Pearl Harbor was attacked. That phrase also applies to November 22, 1963, when John F. Kennedy was assassinated. It applies to September 11, 2001. Those dates will stay forever in the minds of every American, not only as tragedies, but as reminders. We have built an incredible nation, one that leads the world in so many ways. We can never forget, though, that we still live in a world of other nations with different philosophies and ideologies. We have to keep in mind always that no matter what we build and accomplish on our own soil, we cannot become so complacent as to think we are safe from atrocity. Start by digging up intimate facts about your characters. Not everything about them, just the things we really need to know. Ideally, this includes the two or three key nuggets of personality or character history than can make you fall back in love with your story. Q. Why were you involved in the accident? A. I overcorrected because Sara distracted me. Interviewing characters can reveal traits and faults you never knew existed, which can lead to various plot complications and solutions. Then, when you rewrite that blocked scene, you can take a new run at the wall and watch it disappear because you have character knowledge that allows you to view the scene through new eyes. First, let me say how happy I am to be a member of the Make Mine Mystery team. There is a wealth of talent here, and I feel fortunate to be part of the group. Hopefully, I'll not embarrass myself too much with my posts. Yes, I'll be letting you know how my writing career is going, but beyond that, I'll be writing about some of the things I've learned through the school of hard knocks. A lifetime of reading, almost twenty years of writing, and varied experiences in editing have given me perspectives on the business I enjoy. One of these is the use of quotation marks when italics are appropriate. (Note, I said appropriate, not required.) Too often, as I edit, I see people use either single or double quote marks when trying to emphasize. It may be a title, the words contained in a note, a foreign word or phrase, or simply a hard hit on a word in dialogue. He whistled the song, "Love is a Many Splendored Thing" should be, He whistled the song, Love is a Many Splendored Thing. Same with book titles or poems. "The Old Man and The Sea" should be The Old Man and The Sea. The note read "Meet me in the garden at eight o'clock" works better as, The note read Meet me in the garden at eight o'clock. Unless you have a note that can actually read. "Prenez-moi a votre chef" sure works better as Prenez-vous a votre chef in dialogue or out. "Get 'out' of here" is better written as "Get out of here." Emphasis on out, of course. If you find any of the above in my latest, THORNS ON ROSES, a South Florida thriller, I owe you a Killian's. It (the book, not the beer) is available as an ebook or a paper book. Back when my first novel was coming out, I set out to write a series of short stories with the idea of building up buzz for the novel. It didn't work, in part, because too many magazines that published short stories were closing down and ezines had not yet found readers. So, even though many of my stories were published, they didn't enjoy much readership. This summer, I decided to republish those stories as ebooks with the hope of reaching a new audience. The eight stories in the Val Lyon series are being released singly. A collection of all eight will follow, probably by the end of this month. I have already promised copies of the collection to some of you and I assure you it is coming. In the meantime, here are the stories that have been released so far through Smashwords and Kindle. The Big Dance With Death appeared in 2001 in FUTURES. It's my longest short story to date. The big dance, of course, is the NCAA basketball tournament. 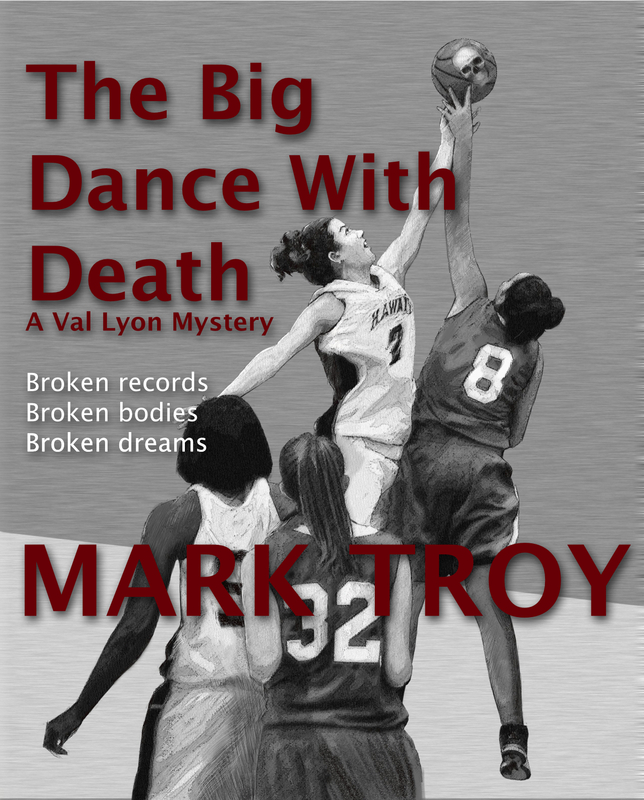 In this story, Val Lyon takes a job as assistant coach of her alma mater's basketball team in order to find out who is threatening two of the players and why. Along the way she discovers that the death of her predecessor as assistant coach was not an accident as originally thought, but was a murder. Drop Dead Zone was my first published mystery story. It features Val Lyon on her first skydive. 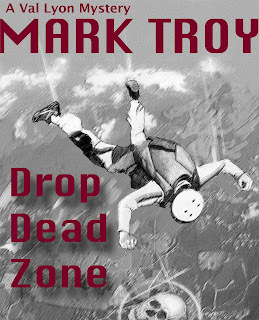 Drop Dead Zone appeared in Mystery Buff Magazine in 1998 and was nominated for a Derringer Award by the Short Mystery Fiction Society. The title of this story came about before the story. A group of us were drinking beer following my first skydive when one of the jumpers, now my daughter-in-law, said I needed to write a story about it. We came up with the title immediately. Drop Zone from where skydivers jump; Dead Zone from the Stephen King story; and Drop Dead from what we all wish for people who annoy us. It took a lot longer to write the story because I wanted the murder to happen in the air, or at least result from something that happened in the air. I also had the idea that I did not want the murder to result from tampering with the parachute as I thought that was probably a cliche'd method. As a result, I spent a lot time trying to figure out the murder. Note: Tampering with equipment would not have been a cliche' because Drop Dead Zone, to the best of my knowledge, was only the second skydiving murder mystery. Two more have been published since. Mystery Buff Magazine debuted in January 1998. Drop Dead Zone appeared in the February issue. The March issue was printed but never got into the mail and no more issues were printed. See what I mean about markets shutting down? 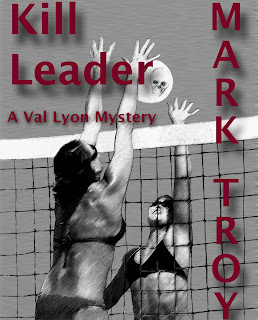 Kill Leader is a story about beach volleyball. Paula Evangelista—Vengelista—is at the top of her game on the beach volleyball circuit. Knocking down kill after kill, she is trying to regain her title of kill leader. But someone wants to put an end to her streak and maybe an end to her life. 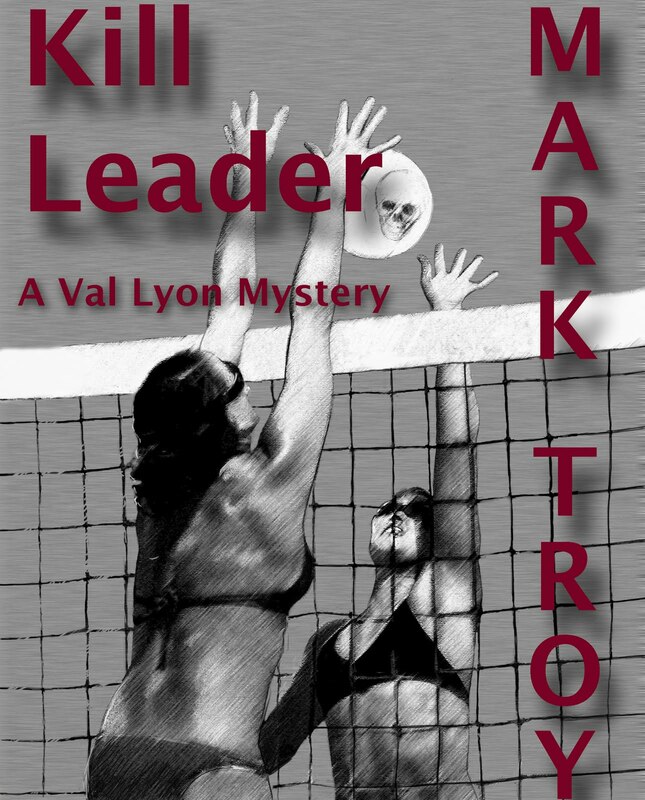 It is up to Val Lyon to find out who wants to kill the kill leader and prevent it from happening or end up as another kill herself. The title for this story came first. I was at a Texas A&M volleyball game with my wife and, while reading the program, saw that one of the players led the conference in kills. I thought, "She's the kill leader." How could a mystery writer NOT write a story with that title? Kill Leader appeared in the inaugural issue of Plots With Guns, a great hard-boiled ezine, which continues to this day. The inaugural issue didn't have many readers, but Kill Leader has had some pretty good success with Sniplits as an audio book and as part of an anthology, Killer Fiction. The cover art for these stories were drawn by David Shackelford of Austin, Texas. My favorite so far is the Kill Leader cover. Next up is Horns and after that will be Teed Off. Wait until you see those covers. I won't go into the programming part of Killer Nashville as Mark Troy (whom I was delighted to meet) covered that quite nicely. Getting to Nashville was a chore. I probably wouldn't have gone at all except I'd already bought plane tickets to Omaha for hubby and me to attend Mayhem in the Midlands which was cancelled. Not wanting to lose the money I'd paid for the tickets (no refunds) I coughed up some more money to buy the new tickets. We were too late for the cheaper shuttle and had to take a taxi--not cheap. The hotel was luxurious--it had been renovated from an old social security building. The front was beautiful--the back looked what it had once been. The rooms were great though a bit confusing. Hubby loved the shower and the bed--me too. But there was an odd light that you pushed to let housekeeping know you wanted the room made up. We pushed that by mistake one night and had a phone call asking if that was what we really wanted. Several times when we were already in bed, the door bell chimed and a housekeeper had come to turn down the bed and give us chocolates and water. The restaurant in the hotel was pricey but there were lots of good eating places a short walk away. We found a Chinese buffet, a great Italian restaurant and we ate twice at a nearby brewery. Best of all at any of these mystery conventions are the people. It's rather like going to a high school reunion and seeing people you haven't seen for a long time and playing catch-up. I can't remember the names of everyone, but I was thrilled to have breakfast one day with Luisa Buehler whom I met at Love is Murder. Mike Black was there (know him from PSWA) along with his darling girlfriend. I was happy to see Chester Campbell and his lovely wife. I met people who've been on my blog and felt like I already knew them. We spent a lot of time with Radine and John Nehring. It may be the last time we'll be together in person as he won't fly and they live in Arkansas. After our wearing flights, we've decided we'll probably stay in California or close to it from now on. We always enjoy the Nehrings company. I saw Mary Saums too, another Love is Murder attendee. I know there are more but they aren't coming to mind at the moment. My Oak Tree Press publisher was there too, Billie Johnson, and we shared a couple of meals and spent a lot of time just schmoozing. I'm happy with both my publishers so didn't do any of the one-on-one sessions. I did feel like those in charge don't really understand the impact of e-publishing on the book world. I saw so many people using electronic devices of one kind or another to read on the plane. Many more than the last time I flew. I also felt that the moderators of some of the panels needed some training as how to be a moderator--keep control of the panel, be sure and introduce everyone (on one panel I felt like I was invisible or perhaps the moderator didn't think I was important enough to mention--though I managed to get my nickel's worth in on the subject discussed), that the moderator should make sure everyone gets equal time to share their expertise on whatever the subject is and not take up all the time themselves. These things happened on various panels though I went to others with great moderators. Everyone complained about the heat outside (it was all of 80 degrees) but we thought it was great, having come from 100 degree weather. The meeting rooms were freezing--but I always expect that and know to bring clothes with long sleeves. The only ones who had a signing table after a presentation were the big name authors. I think this really kept people from buying books from the other authors. They were trying to keep the smaller authors from feeling bad if not many came to their table--but I'll happily sign for one or two who've purchased my book. At least three people bought my books and sought me out for an autographs--but I think the old-fashioned way of doing signings might have resulted in more sales for everyone. Running a conference is difficult. I do the program for the PSWA conference including the panels and it's not an easy task, this I know. Overall, it was a great conference. One I'd attend again if it weren't so far away. Hubby and I had a great time and he loved the forensic panels. Going home was easier than coming, more time between plane changes. And that's my report on Killer Nashville. P.S. I also got to see Randy Rawls! Plans have a way of going awry. Mishaps can occur when you least expect them. They can change your immediate or long term future, can be irritating, inconvenient and sometimes cost money. Take advantage of these mishaps and don't let them go to waste by including them in some shape or form in your plotline. A while back I was bit in the mouth by a golden retriever, a scary, unexpected experience. One side of my lip was hanging down and I looked a sight. Fortunately, I had a plastic surgeon whom I'd already used for removing skin tags a few times. If he hadn't come to the emergency room to sew me up, I may not have healed properly. 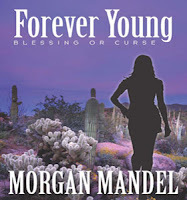 One of my characters has a similar experience in Forever Young-Blessing or Curse, but he's not as fortunate as I was. That's not the only time I've used a mishap to advantage in one of my books. At one time I suffered from dizzy spells, shaky hands, and sometimes double vision, which were symptoms of a bout with hypoglycemia, a/k/a low blood sugar. I decided to bequeath a form of this episode in my life to the main character, in my romantic suspense, Killer Career. I wanted her to suffer, wonder what was wrong, yet be able to get better. I'm probably not the only one who does such mean things to my characters. Tell us what mishaps you've taken advantage of in a plotline of one of your books, or maybe you've noticed one in a book which is similar to something you've experienced. Now that I have three mysteries on the market, it's high time to evaluate the marketing. Let's start with choosing a title. Of my three books, none has an original title. When Pigs Fly sounds like a children's book, and in fact it's several children's books. Search for the title in Amazon and 12 titles pop up. On the other hand, people tell me it's a clever title, so go figure. Although it fits the story well, it doesn't stand out in the crowd. The worst title is Getting Lucky, which sounds like a steamy romance and doesn't even show up on the first page of an Amazon search. It's on the second page, languishing as item #15 out of about 50. Lots of covers showing passionate love scenes and cleavage show up before mine--even one with a picture of an 80-year-old lady! Like many middle children, my Getting Lucky hasn't gotten much attention, and the Amazon rankings prove it out. I published it through iUniverse and am thinking of reissuing it with a distinctive title using CreateSpace. Little Mountain works out best, displaying prominently at #2. It's not unique, but it is a bit different. The lesson is to choose your title carefully. At least search Amazon for any title you are thinking of using., and do it before you commit yourself. Tip: If your book doesn't come up quickly on an Amazon search, find the link to it and create a shortened URL with either the title or your name in it. There are lots of tools you can use, but I like Tiny URL at http://tinyurl.com. It gives you two choices: either a random and meaningless (but short) URL, or the option to customize it. That way you ask everyone to visit tinyurl.com/titleofmybook. How do you choose your titles? Do you consider only the content of the story, or do you consider the market? I've been going through an interesting exercise. When I first started writing mystery novels around mid-1989, my reading experience for the past several years had been mostly confined to Cold War spy stories. I devoured all the John le Carre, Graham Greene, Len Deighton, Robert Ludlum, and Tom Clancy books, among others. So it was only natural to put my fiction writing efforts into that genre. Except at that time, it became post-Cold War espionage. I started with a trilogy featuring a disgraced former FBI agent modeled after a man I had met through a friend. I had a different agent for each book, which is another story I covered in my Mystery Mania blog. A couple of the manuscripts got good marks from editors, though they didn't happen to be what the editors were looking for. So no sales. Along with the other four books I wrote before my first manuscript sale, I piled them up in a corner of my office. And in a corner of my hard drive. After reading what people like Joe Konrath and Rob Walker had been doing, I decided it would be a good thing to revise the trilogy and turn them into ebooks for the Kindle and Smashwords. When I finished work on my new Sid Chance thriller, The Good, The Bad and The Murderous, I put the first book, Beware the Jabberwock, in my laptop and began reading. The first thing I noticed was it ran better than 125,000 words. My published PI novels average around 70,000-words. The next things I noticed were lots of adverbs and many dialog attributions besides the ubiquitous "said." Another interesting development was a lack of hesitation in shifting points of view. It wasn't done willy-nilly, but when I wanted to reflect a character's thoughts or feelings, I did. There was never any doubt as to whose head I was in. In each scene, I described the surroundings in detail. Not so much in this book but in the third of the series I ran into problems the agent referred to as "overwritiing." It ran over 600 pages. My editor on the first published book straightened me out on some of this. Besides generally being too wordy, I was saying the same thing in different ways. And I was guilty of over-explaining what was going on. The editor said, "Don't play down to your readers. They're smarter than you think." Re-working the story after twenty years, I was impressed with the research I had done. I found a lot of good information I had forgotten about. As I moved along, I cut down on the adverbosity (sounds like it should be a word), changed most of the attributions to "said" or "asked," and used breaks before changing points of view.I didn't shorten the manuscript by much, but since it's a thriller, that shouldn't be a problem. The one negative comment from any of the editors who read the original Jabberwock manuscript was that it "did not seem quite as fast-paced and compelling as a thriller of this type should be." I'll admit it doesn't run at breakneck speed, but it's a story that develops over an eight-month period. It has tense moments and lighter moments and picks up speed as it goes along. My usual first readers will have a go at it, then I'll put it out there for the ebook audience and see what happens. Meanwhile, I have two more to revise. Have you tried anything like this?